The program is available for Mac and PC. It costs $45 for Mac, $40 for PC (and knock about 12% off for the education discount). It's easy to use, and far, far superior to Word for composing long-form files. Three specific uses have occurred to me: 1) for teachers writing a test bank, 2) for math teachers writing a problem set, and 3) for debaters to go paperless (and yes, I think it's better than going paperless by using Word templates, but it depends on the debater's personality and the squad setup). But first, I'll give you a basic overview of the program. The screen layout is customizable, but this layout shows you three elements of the program: the Binder (left-hand pane), the editing window, and comments/footnotes (right-hand pane). The document editing window is just like Word's draft or online layout view. The Binder allows you to sort your work into subdocuments. You can go as many levels deep as you want to. Note the research folder -- more on this later. The right pane is the Inspector. 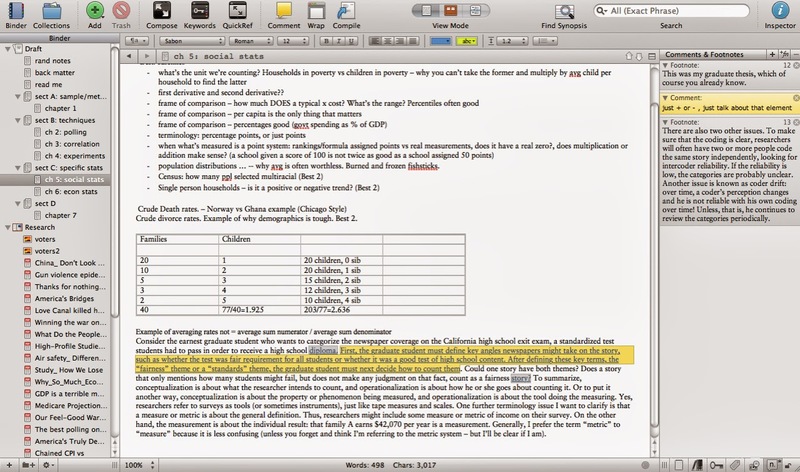 Footnotes, comments, meta-tags, and even more tools to annotate your work as you go. Note the Compile button in the top center. This is the "print" function, but unlike Word, there is a lot of control over what you print. You decide which subdocuments to print, whether comments or footnotes print, etc. I have ten versions of the chapter 2 test saved on my computer in Word. I'm not sure how exactly they differ. I rotated some problems out but kept some. I merely reordered some problems to create different forms of the same test for different periods. I would have to open all ten versions and spend two or three hours to sort out this mess. 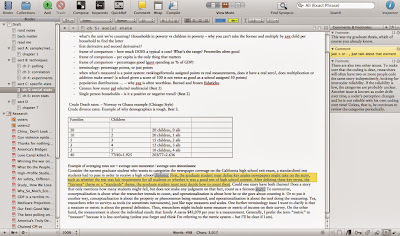 Option 2 is to aim even higher, making one Scrivener file your whole-year test and exam bank. You would need to make a different document for each unit, and then subdivide each of these documents into separate, appropriate subdocuments (such as question type). Since there's no limit on how many levels deep you can go, it seems like making a bank for the entire year should not be a problem. You can keep records of how students do from year to year in Scrivener in a subdocument you never print. You never need to misplace your data again! Scrivener has a special advantage: MathType can easily be integrated. A further advantage: you can use the comments/meta-tags field to categorize problems by concept or difficulty, to write in the solutions to problems, and to make notes on what problems students find the most challenging. You can also insert tables and graphics for your problems and -- this is the best part -- you can import the source files, in whatever format you have, directly into Scrivener. Data is in Excel? Drag your Excel document in, and it'll live safely in your Scrivener file. GeoGebra file? Drag it in! The GeoGebra file will live safely in the Research section of the Binder. When you click on an imported file, the appropriate program will start. For example, clicking on a Excel document in the Research section will cause Excel to start and open the file. However, these imported files are not "linked." You can't edit the Excel document and have those changes reflected in Scrivener. You have to copy the updated data from Excel back into your document. And you have to reimport the Excel file itself. But you can delete the original file, and the copy will live in Scrivener, and you never need to worry about losing it. Before I started using Scrivener, I would make my diagrams in GeoGebra, then throw the GeoGebra file away. It just got to be too much to manage all of them. But now with Scrivener, now I can keep all of my GeoGebra files neatly organized. While I'm on it, GeoGebra is awesome. It's easy to use; it's pretty darn powerful; it integrates geometry and algebra and functions and even statistics; it's stable; and it's free! I make almost all my diagrams, from my Geometry to my B.C. Calculus class, in GeoGebra -- the only exception is 3D stuff. Download it for free here. It's available for PC, Mac, Linux, as an add-on for Chrome (it's a little slow but alright), as a iPad app, as an Android app, and as a Windows tablet app. Anyway, back to Scrivener. The one downside is that you can't do fancy page layouts. You can resize an image, but you can't rotate it. You can make a table, but you can't combine cells or resize them beyond the default. You can't double-column or do tab stops. Or auto-numbering. Header and footer options are limited. However, you can export your document to a Word file where you could do those things. I think those deficiencies are far outweighed by the positives. Scrivener makes no claim to be a layout program; its goal is to help you write and edit your rough drafts, and mostly, I think its draft quality (as it were) is good enough for making a math problem set! The Binder can be a tub or accordion file, organized into different sections, e.g., neg > disads > econ da > links > ACA > specific cards or briefs. There are heading and subheading text styles, which could the tags, and the body text style could be the card text. The footnotes could be the citations, and comments the debater's annotations on each card or brief. Here's the template I created. Everything is at your fingertips, in one file (no need to open separate Word documents). 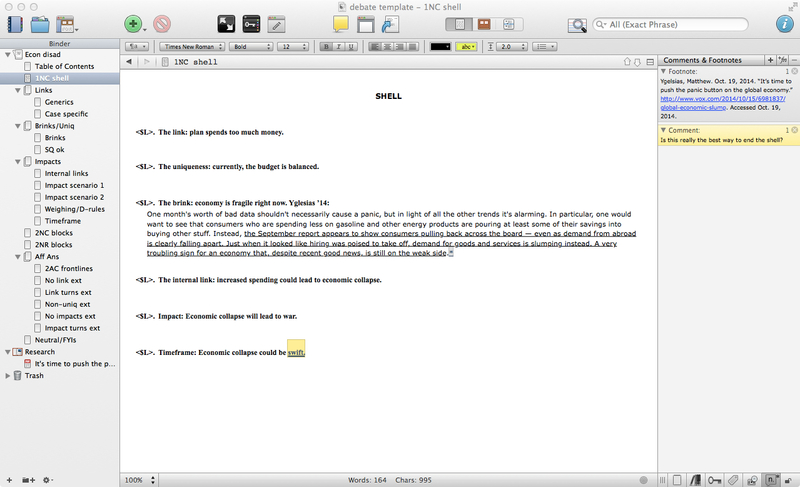 Scrivener doesn't seem to have any size problems. Because it's designed to write books, it clearly can handle a lot (as opposed to opening up an equivalent number of files in Word, which does seem to tax my computer). The best part is that everything is searchable and search results can be filtered, e.g. a student can find a link card with a specific phrase even if he can't remember which disad it's a part of. I imagine that a debater would use Scrivener to a) import his research files, in PDF, html, or Word documents; b) use Scrivener to write his briefs; and then c) use Scrivener in round as his document system. I imagine that he would work from a copy in each round, so he doesn't screw anything up permanently by accident. I would want my debaters to create a document for each speech at the top of the Binder, and then drag-and-drop the evidence they need to read into each speech document. The best part is that, when they need to share evidence with opponents, the "compile to PDF" option is awesome. The debaters can select only what they've read, and while the footnotes can be printed, the comments/annotation don't have to be printed. The only difficulty is with sharing. It's easy to import files, but you can't use Scrivener to collaborate. I could imagine a team of two using one Scrivener file, synced through Google Drive or Dropbox, but I can't imagine a whole squad doing so. Scrivener is a great program. It's super easy to import into; it's super easy to use; and it's super easy to export into different formats for final editing for page layout. Plus, they'll give you a free trial.